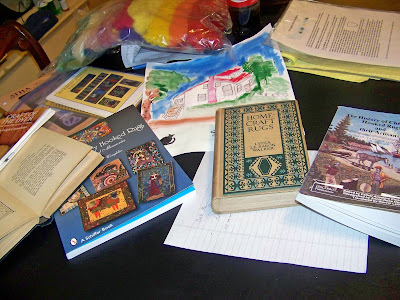 I was feeling really scattered today and I suddenly realized why - the photo shows my work table. It was a complete blank at noon when my mother's nurse came for a home appointment. Ever since, I have been doing a little here and a little there - sort of "grazing" on my various non-hooking but hooking projects. I went through Linda Rae Coughlin's Contemporary Hooked Rugs and was inspired by the tremendous variety in the amazing rugs inside. I re-read the chapter on rug hooking in the 1927 Home-Craft Rugs by Lydia Le Baron Walker - I really enjoy her history of rug hooking. She traces hooking back to just after the Colonial period - which I enjoy because I want rug hooking to be an American craft, not a British Colony craft. She also talks about home-made backing used for rugs before burlap was available. I also spent a few minutes in Cheticamp with The History of Cheticamp Hooked Rugs and their Artisans by Chiasson, Deveau, and LeBlanc - the story of hooked rugs rescuing a poverty stricken community is compelling, but the book is not easy reading, perhaps because it was not written originally in English. I put it down in favor of How to Make Hooked Rugs by Mary Perkins Taylor, written in 1930. She works with hand-torn strips and makes some very detailed rugs, but I was not happy with my attempt at her technique, so I was looking for clues to what I had missed - I think I just tore my strips too wide because I wanted them to be wider than I could cut easily with my cutter.